**The purpose of a forced air system is to reduce the difference between the temperature of the mirror(s) and the ambient air temperature. There are two distinct cases. One is internal temperature gradients within the mirror. The second is the bulk temperature of the mirror. The former can cause figure distortions, while the latter produces performance losses at the boundary layer; an incredibly sensitive thermal gradient layer at the optical surface, degrading the performance of the system by surprisingly large amounts. **Boundary layer issues are a problem for all mirror materials. The use of zero-expansion mirror materials (for solid mirrors) does nothing to eliminate the mirror's thermal mass. It can greatly reduce mirror (itself) figure distortion from internal temperature gradients but this often comes at the expense of high costs and greater mechanical figure distortion because the mirror mount's most often used are made of inexpensive, high CTE aluminum. 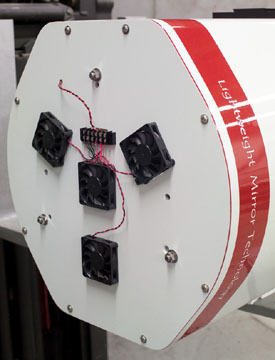 As temperature changes, the zero-expansion mirror itself changes by parts per billion but is being distorted mechanically because the aluminum mirror mount is changing shape at greater than 400 times the rate of the mirror, due to its high CTE. **Within non-zero-expansion glass types; Pyrex, Borofloat, E-6, etc., internal temperature gradients distort the figure of the optic. For a 16" solid mirror that is 2" thick, a 1°C internal gradient will distort the figure of the mirror by roughly 1/3rd wave (~183nm of distortion). For plate glass this distortion is even larger because the CTE is nearly 3x higher than borosilicate glass types. **The benefits of Dream's unique Filtered Air System Technology (FAST) are numerous. It allows a much greater volume of air than other designs. This is due to the enormous surface area of the high-performance K&N filters used and because of the specific high-volume, low-vibration fans used. The large surface area of the filter media causes far less static pressure than placing small blocks of filter media directly on a fan. The higher the static pressure, the greater the loss to the air volume moved. **The combination of Dream's carbon fiber, FAST and zeroDELTA engineered lightweight mirrors produce a system that deals entirely with the historic problems of both figure distortion and the boundary layer. The entire instrument reaches and then follows ambient temperature changes (delta) faster than any other system in the world, because Dream has dealt directly with the known, age-old problems within opto-mechanical systems. Dream's carbon fiber was designed to closely match the CTE of zeroDELTA lightweight mirrors so it maintains performance of the mirrors over extremely large temperature changes, while simultaneously producing an athermal telescope. Why does Dream put so much effort into equalization? Dream's use of FAST provides numerous additional benefits that no other systems offer. We are filling the telescope chamber with filtered clean air. This helps keep the optics cleaner for a much longer length of time. For remote imagers/science, we advise our clients to leave the fans on all the time, even during the day. These fans are very light and efficient, using less than 10 watts altogether. Leaving them on has additional thermal benefits but it also eliminates the need for automated front aperture covers for the instrument. Moving air does not allow dew formation. Moisture is the leading cause of dust and other air borne materials adhering to surfaces. FAST keeps the optics prestinely clean, the thermal benefits are enormous and insects, especially spiders, do not enter the tube. Dream is the only company in the world utilizing FAST. 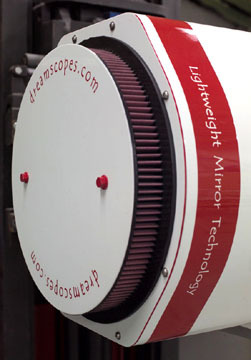 Dream is also the only company in the world offering a standard optical instrument that utilizes engineered lightweight mirror blanks for both the primary and secondary mirrors. This combination produces unrivaled speed in equalization of the optics. Copyright &COPY; 2003 - 2017 Dream Telescopes & Accessories, Inc. All Rights Reserved.